Andy B and Richard were on duty today and the first task was finding a field setup that, despite yet more rain overnight, would work without damaging the field. With the wind from the south-west, a one-nine landing direction was favored and there was actually a strip maybe 2 meters wide which had boggy ground either side. 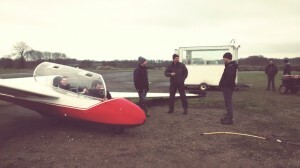 Spot landings and no excuses were order of the day. The launch-point was placed on the south-east hard runway with the winch on the south-western edge of the perimeter track so the (single) cable could be towed along the southern track. Low cloud hampered initial launches but later, despite a measly 870 meter cable run and a crosswind, launches were as high a 1350 feet. At least part of this could have been down to the new direct signaling system which seems to avoid long ground-runs. In total a small crew, late-start, single cable operation and one glider did 17 launches including some attempts and soaring in lift from the Snitterfield ‘ridge’. Thanks to Andy and Richard for finding a way to make the day work. K13 tailplane. Still mud-free just before the last launch of the day. 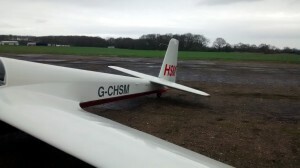 This entry was posted in Flying reports and tagged flying report, mud, rain by admin. Bookmark the permalink.